Disability is too often left out of the academic and political discourse concerning equity, diversity and inclusion. Yet disability is a core aspect of these values and intersects with all other marginalized groups for which equity, diversity, and inclusion are critical. 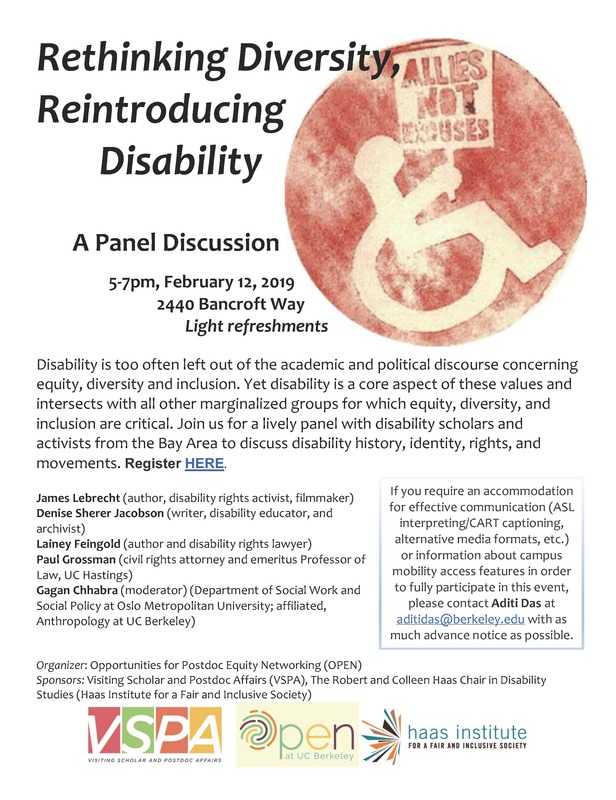 Join us for a lively panel discussion with esteemed disability scholars and activists from the Bay Area to discuss disability history, identity, rights, and movements. If you require an accommodation for effective communication (ASL interpreting/CART captioning, alternative media formats, etc.) or information about campus mobility access features in order to fully participate in this event, please contact Aditi Das at aditidas@berkeley.edu with as much advance notice as possible.